The Fort Pitt Museum, located in historic Point State Park in downtown Pittsburgh, is a two-floor, 12,000-square-foot museum that tells the story of Western Pennsylvania’s pivotal role during the French & Indian War, the American Revolution, and as the birthplace of Pittsburgh. The strategic location of the fort – at the Forks of the Ohio River – helped to shape the course of American and world history. 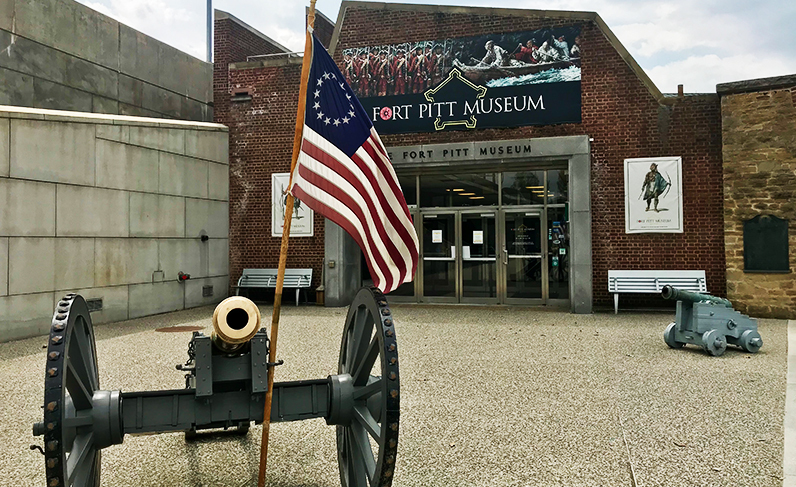 First opened in 1969 in a reconstructed bastion, the Fort Pitt Museum provides visitors with a rich understanding of the world-changing events that occurred right here in Western Pennsylvania. Through interactive exhibitions, life-like historical figures, and recently added artifacts, visitors will learn the important role our region played in shaping the United States. Step back in time and learn about the importance of Fort Pitt with museum director Alan Gutchess. The Fort Pitt Museum is open year-round except for closures on New Year’s Day, Easter, Thanksgiving, and Christmas Day. June – August 2018 | Saturdays & Sundays | 11 a.m. & 2 p.m. Call the Fort Pitt Museum at 412-281-9284 for more information. Visitors to Fort Pitt Museum can present proof of admission at the Heinz History Center to receive reduced admission. Offer valid same- and next-day only. The admission fee paid at Fort Pitt will be applied toward regular admission at the History Center. Additionally, visitors paying full admission at the History Center can present proof of admission to receive free same- and next-day admission at the Fort Pitt Museum. For more information about planning your next visit, please contact the Fort Pitt Museum at 412-281-9284.